Judith’s two non-fiction books are both biographical. 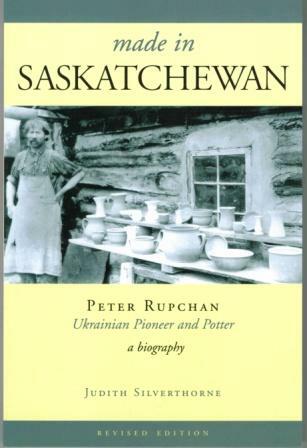 Made in Saskatchewan is based on the life story of Peter Rupchan, a Ukrainian pioneer and prolific potter that lived in northeastern Saskatchewan. 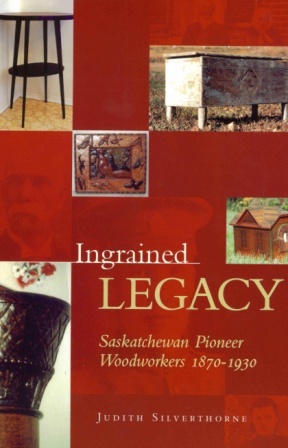 Ingrained Legacy: Saskatchewan Pioneer Woodworkers is a collection of short biographies on Saskatchewan’s early woodworkers from 1870 to 1930. Ingrained Legacy features a rich, comprehensive selection of over eighty dedicated pioneer woodworkers who immigrated to the prairies at the turn of the century. All of them did their work by hand with materials available to them in their particular locations. Besides giving a synoptic look at their lives and a reflection of their diverse ethnic backgrounds, talents and abilities, this sig­nificant compilation provides hundreds of visuals of their extraordinary work and insights into how they managed to survive. The collection includes 400 black and white images of furniture and woodworkers.